Remember a few weeks ago I made vegan meringues? 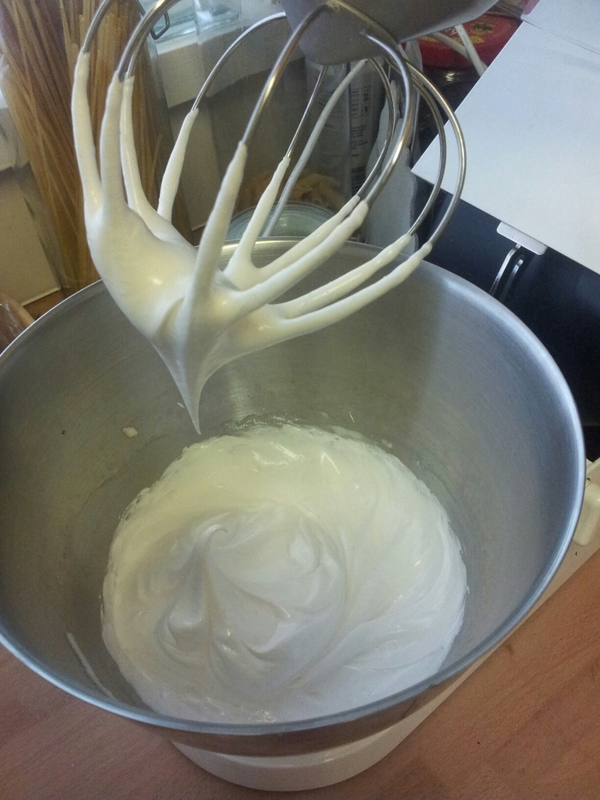 Well since then I’ve had a few more experiments and also found a great group on Facebook, Vegan Meringue – Hits and Misses!, dedicated to all the wonderful uses for aquafaba. This is the term which has been coined to describe the “bean water” that everyone is going mad for! So of course the next challenge, inspired by some very talented people in the group, was to attempt that wonderful French classic, the macaron. It took me two attempts to get these right but it was so worth it, the light and delicate biscuits were a delicious triumph and went down very well at my dad’s birthday lunch. I slightly winged it with the recipe first time, hence their failure, so for the second batch I adapted my recipe a little and based it on the recipe and technique used by the very talented Charis of Floral Frosting, but with my own flavour combination. So, without further ado, I give you vegan coffee and hazelnut macarons. Enjoy! Start by reducing the aquafaba until you have roughly 1/3 cup of liquid remaining. This reduction is key I think and was a step I missed in my first batch which were much too wet. Set aside to cool completely as it will then whip up much quicker and more easily. While it is cooling you can prepare the dry ingredients. Put the ground almonds into a food processor and blitz until you have a fine powder. Don’t overdo it though as you might end up with almond butter! Add the icing sugar and mix until fully combined. Transfer the mixture to a sieve and pass it through, discarding any large pieces of almond which won’t pass. Then blitz the instant coffee and sieve into the bowl with the almond mixture, or simply break up the pieces in the sieve and pass them using the back of a spoon. Once the aquafaba has cooled, pour it into a non-plastic bowl and mix on a high speed until you have stiff, white peaks. I used my Kenwood chef, but I have also done it by hand before with a little whisk so you don’t need a fancy stand mixer. Then slowly, a spoonful at a time, add the caster sugar to the aquafaba. Waiting until the previous spoonful has been fully incorporated before adding more. When all the sugar is mixed in add the vanilla extract and whip until it’s all combined and you have a glossy meringue mixture. Remove from your stand mixer if you’re using one as the last part needs to be done by hand. Add 1/3 of the almond/sugar/coffee mixture to the meringue and very gently mix it in using a spatula. Repeat twice more until the whole mixture is incorporated, being careful to not knock the air out of the meringue as you mix. Then comes the ‘macaronnage’. Basically you use the spatula to spread the mixture across the inside of the bowl, then scrape the spatula against the edge of the bowl under the mixture, folding half of the mixture over onto itself. Repeat 15 – 20 times. Does that make sense? If not, or if you’d like to see some pictures of the process, Charis shows it here. Transfer the mixture to a piping bag with a round tip, and pipe one inch round circles onto baking paper on a baking tray. Don’t put them too close together as the macarons will spread slightly. Once you’ve done a whole tray you need to knock out the big air bubbles by lifting the tray about a foot off the work surface and dropping it back down. This will also help to even up the shape of your macarons. If any of them still have a point sticking up from where you piped, use a clean, wet finger to gently press it down to the level of the top of the biscuit. Set the tray aside and leave it for at least an hour or two to allow the macarons to form a hard shell on top. This will give them the classic shape and shiny top, and help to form the pied or foot. After this time you should be able to gently touch the tops without them sticking to your finger, this tells you they are ready to bake! Heat the oven to 100°c and place the trays of macarons inside. Now, my oven’s fan is efficient and the temperature is fairly even throughout and I’ve found that I get an even batch without only using the top shelf. If your oven is hotter at the top then only bake one tray at a time at the top of the oven. Bake for 30 minutes then, without opening the door, turn off the oven and leave the macarons inside for 15 minutes. Finally crack the oven door open using the wedged wooden spoon method and leave to cool for another 15 minutes before taking them out. Repeat for all your trays until they are all baked. To make the icing, cream together the margarine and the icing sugar and slowly add the hazelnut syrup until you get the desired consistency. Transfer to a piping bag (I used a star tip) and pipe the icing onto half the batch of macarons. Match up a second macaron for the top of the sandwich and voilà! 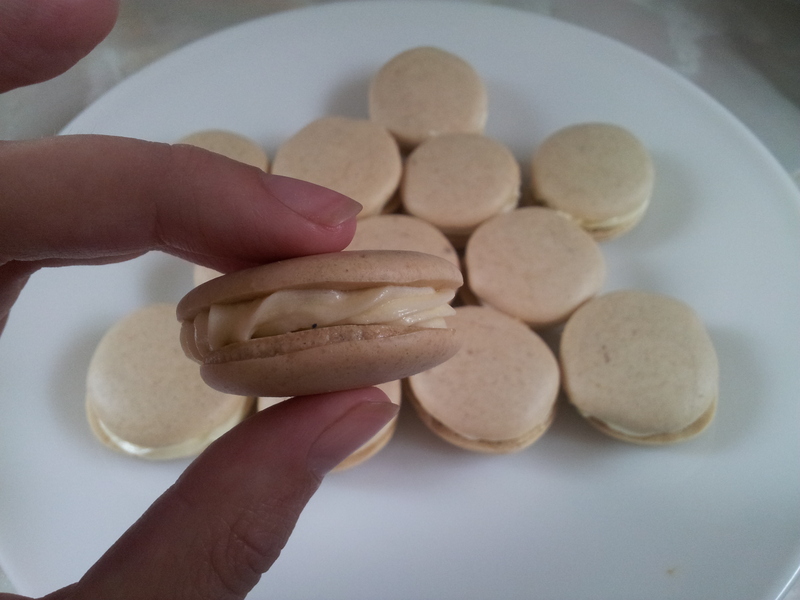 Now I’ve caught the macaron bug I’m sure I’ll be making these again and experimenting with other flavours. Give it a try and let me know how you get on!